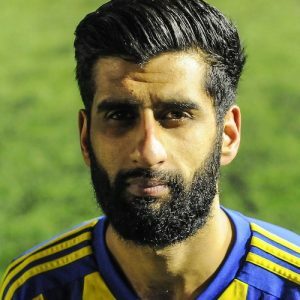 Gaz Singh – came closest to an equaliser for Khalsa. Khalsa’s attempts to derail Wood’s title run might have only been partly successful as they crashed to defeat by a single goal in the Easter Monday sunshine. The narrow margin of victory may prove decisive as Ilkeston – on the same points but with an inferior goal difference of two at kick off – romped to a 7-0 victory against Dunkirk, giving them the upper hand going into the final weekend. In the eighth minute the visitors fell victim once again to the ‘Only One Player Can Be Offside’ rule that officials at Step Five struggle with so badly. This was a classic of the genre and saw the very, very offside John Atherton not flagged while the only-slightly-offside Paul Sullivan got a free pass from the linesman and quite happily surged through and finished in style past Sam Arnold. There were then huge penalty shouts at either end. First, Mykel Beckley was scythed down in the box as Khalsa pushed forward, the foul bewilderingly given outside the area. Then, then ten minutes later the livewire Javia Roberts went tumbling under pressure from Leon Miles which was even more surprisingly waved away. Sullivan nearly grabbed his second on 40 minutes, his goalbound shot was cleared off the line by Alex Melbourne and two minutes later Jak Barnes headed narrowly over from Atherton’s corner. Wood controlled the second half, prompting an early treble substitution by Khalsa boss Ian Rowe with Kieron Whittaker, Gaz Singh and Danny Dubidat replacing Alex Perry, Beckley and Jay Holdcroft. Singh provided the nearest Khalsa came to an equaliser, curling an effort just wide on 65 minutes. Roberts lashed one wide on 72 minutes as Wood began to exert more pressure and seven minutes later Arnold pulled off a good save to endy the same player. Barnes produced a timely intervention to deny Singh after good work down the right by Liam Armstrong on 80 minutes and again provided the decisive touch to stop the same player in stoppage time. Khalsa’s misery was compounded on 87 minutes when Melbourne was given his marching orders for dissent. Nobody could deny Wood were good value for their win and now face a possible shoot-out in the last round of fixtures in the pursuit of the title. Sporting Khalsa: Sam Arnold, Carlo Franco, Alex Melbourne, Leon Miles, Tes Robinson (captain), Alex Perry (Kieron Whittaker), Dave Meese, Liam Armstrong, Mykel Beckley (Gaz Singh), Jay Holdcroft (Danny Dubidat), Sean Williams. Subs not used: Alex Woodhouse, Remi Birch.